Live Your Poem...: Helo Mudda, Hello Fadduh... about Poetry Camp! Helo Mudda, Hello Fadduh... about Poetry Camp! Hello and Happy Poetry Friday, children's poets! Be sure to visit lovely Violet (whom I got to meet at Poetry Camp. Yay!!!) at Violet Nesdoly for Roundup. This is my third and final post about my trip to the Seattle area. Here are links to posts chronicling my bookish adventures in Seattle and Mercer Island. But first: hello to new friends I met during my presentations this week at Georgia COMO! Wow, Georgia is full of enthusiastic librarians. (More on this next week.) Yay! and tomorrow for our annual WIK (Writing and Illustrating for Kids) conference. 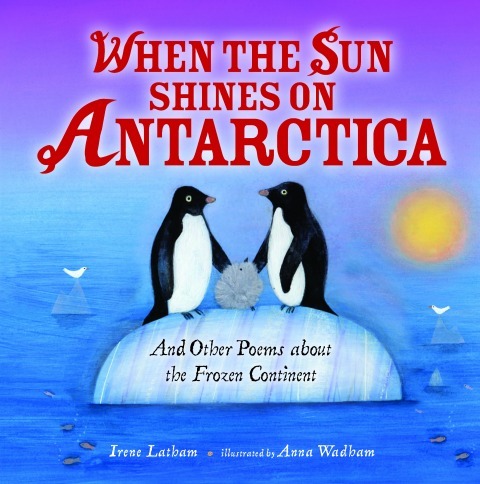 I'll be launching my two 2016 books tomorrow morning, one of which, WHEN THE SUN SHINES ON ANTARCTICA was just named winner of the Silver Moonbeam Children's Book Award for Poetry! Go, penguins, go!! Yes, I'm tired. And no, my schedule isn't always like this. October and April and March tend to be my busiest months for travel. 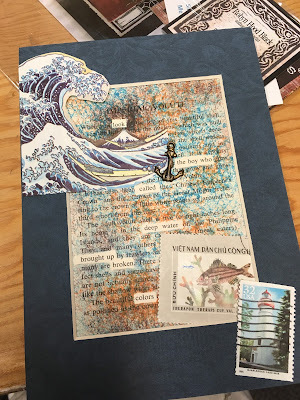 And now, the reason for last week's trip to Seattle, and for this post: Poetry Camp! 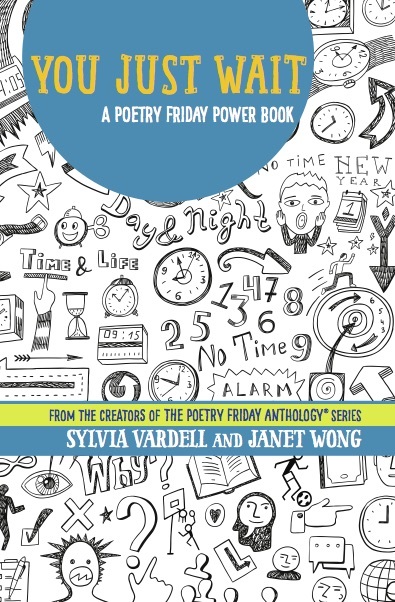 Poetry Camp was a partnership between the good folks Sylvia Tag and Nancy Johnson at WWU and Pomelo Books, aka Janet Wong & Sylvia Vardell! SO much planning went into this event. SO MUCH. And it showed. The whole thing was just kind of magical. Yes, it was like drinking from a firehose (perfect metaphor, Doraine! ), but it was also such a rich and nourishing time. I loved meeting so many Poetry Friday poets... and hearing poets read their own work! Joy joy joy! I learned stuff, too, like some new ways to approach writing workshops with middle schoolers (presented by Sara Holbrook and Michael Salinger). And what great discussions: emotion vs. intellect in poems? Lots to talk about, and how wonderful to make new friends. 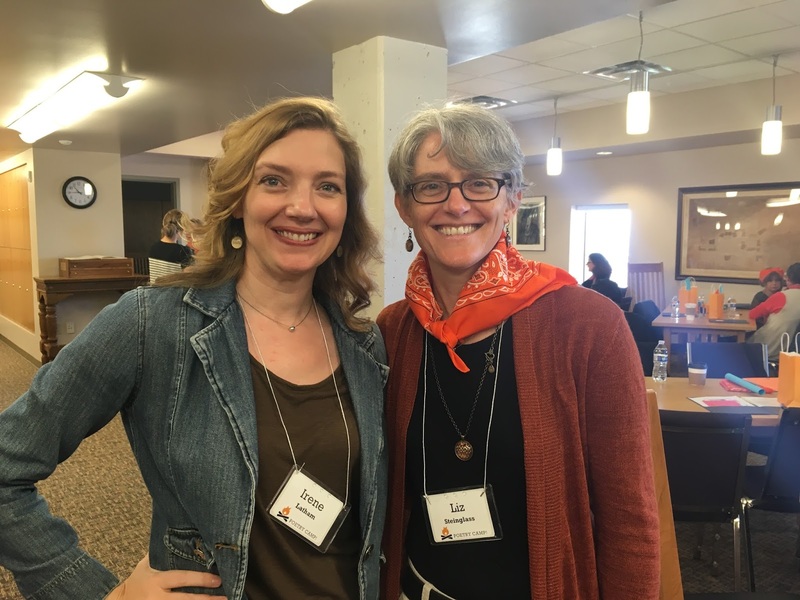 There came a point on Saturday when I had reached my limit -- I'm an introvert, and I wasn't feeling well, and I had been traveling all week... and thank God for Ramona who said, yes, I can take you back to Seattle. Yes, I will get you to your already-payed-for airport hotel. Yes, we can stop at the drugstore. And hey, have you ever tried Starbucks' SHORT (who knew then even had a "SHORT?") caramel apple cider? Well, I have now! Thank you again and again, Ramona! Mwah! Sylvia Vardell posted lots of great photos on her Facebook page. 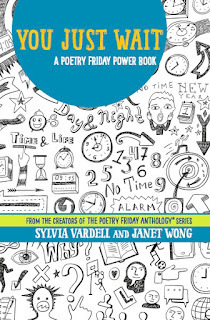 And now, for a poem from the newly released YOU JUST WAIT: A Poetry Friday Power Book, brought to you by Sylvia Vardell and Janet Wong. This book is a writers' notebook and a story and a little bit of everything! One of the poems I love appears midway through the book. black and shiny as an otter's back. at the same time-stopped moment. That final stanza is perfect, isn't it? I can see why you love this poem. Oh, and thanks so much for the shout-out for YOU JUST WAIT. I love Joe's poem too-- so vivid! So wonderful to share a few introverted moments with you, my friend. Lots of memories. Congratulations on your book award! I'm going to get a copy of your book for my granddaughter Julia. How I wish that I could have gone to Poetry Camp with you! I am sure it was a wonderful experience. Congrats on the Silver Moonbeam Award. Love those penguins! 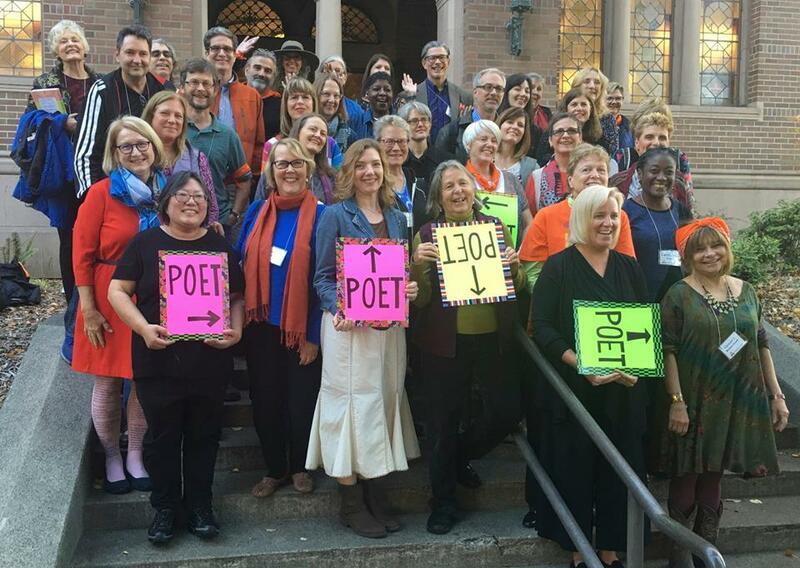 What a wonderful gathering of poets -- with all that talent and enthusiasm in one place, it must have been positively electric! Glad you had a grand time at Poetry Camp. Thanks for sharing the pics and thoughts. Oh, I love that poem too, Irene! From the otter's back right through to the bird of thanks. Also love your beautiful found poem. Hope you have some time for rest and recovery after Southern Breeze. Such a full-on week of is more than enough for anyone! I'm so glad Ramona was there for you! It was perfect to work together. I hope we get a chance to do it again. There's so much going on in the world of children's poetry! Thanks for sharing your review of poetry Camp, and I hope I can join everyone next time - assuming there IS a next time! I love reading about Poetry Camp! And I'd love a copy of the handout. I'm sending an email. Congrats on winning the Silver Moonbeam Children's Award for Poetry! I've loved reading every part of Poetry Camp, and am glad that you made it happen despite your busy life. I think I need to get You Just Wait. There are too many wonderful things shared that I will miss if I don't. That poem, scary happening and I've been there once, turned completely around, but yes, stopped safely. Thanks for all, Irene. It was one of my weekend highlights to meet you, Irene, after sharing these poetry Fridays and many Spiritual Journey Thursdays. I treasure my signed Fresh Delicious and am glad your energy is returning after all your poetry travels. Take care of yourself! Oh, my friend, just reading about your travels this week makes me tired. It was so special to give you a lift back to Seattle. I was the one blessed in so many ways. I loved our book conversations, the peek we had into Friday's activities, and yes, that caramel apple cider was perfect for the rainy evening. Here's to a slower week for you! I love your found-poem creation! Can you explain the process? Did Robyn hand you a glue stick, throw a bunch of materials on the table, and say "go to it"? I'm curious about creative processes. It was more involved than that... ;0) - Feel free to email me, Diane, after the post-hurricane dust settles. (Heading back home tomorrow after evacuating this past week. )I didn't have a printed list of instructions, as we went through each step together. Diane ~ Robyn was AMAZING. What a great teacher. Basically, she handed us a modified, miniaturized kit of the materials she uses in making found poetry art. She gave us each a beautiful factual card about sea life and the materials to color over the words we did not need. Our poem appeared in the words we had not colored. I ended up writing a love poem--what a surprise from a sea shell fact card! Your tired eyes told us all how miserable you felt, and yet you kept on smiling and chatting so graciously. Thank you for being there, Irene! Irene, so great to meet you. I hope you are feeling better. Irene, if only I could have been a fly on the wall at Poetry Camp, I would have been in heaven. I am hoping that one day I will be among those who have the privilege of being amazed by the wonderful group of poet friends who were part of the awesome learning. I think your found poem and makerspace project is fabulous. Do you have a larger photo of what you made so I can show my colleagues? The new proposal I submitted for my ILA 17 team has an idea like this. 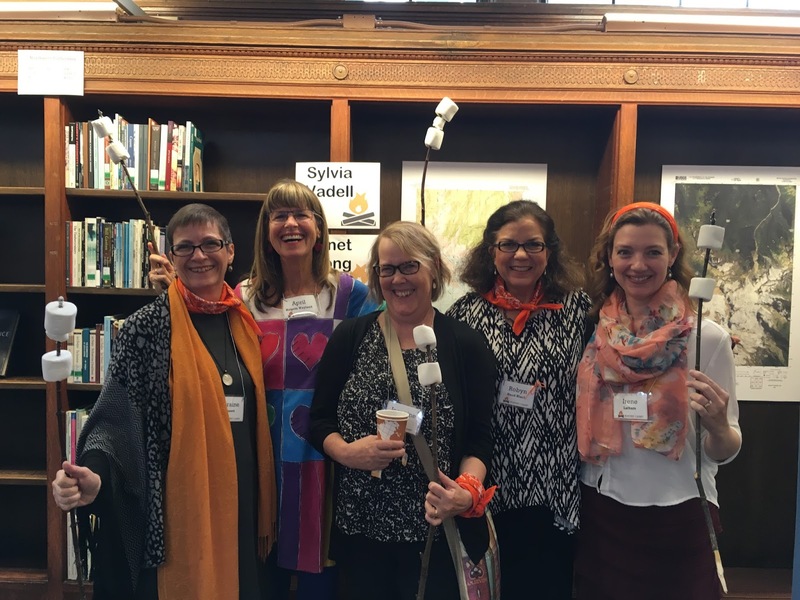 Making, poetry writing, creating, and being with friends: what a delightful event. Just delightful reading of your experience. I've tried to explain to loved ones the weirdness of my extreme social butterfly self and the hermit that wants to be alone, preferably in my blanket fort with cocoa, cookies, books and poetry. I'm so glad you got a bit of rescue in your time of need. We need to keep you in good writing shape. I hope you would be willing to share your hand-outs with a non attendee? If not, it's OK. I would love to see them. Love reading all these entries about that lovely time. I wish I could have gone. Looks like such fun. I love the found art, and that bird of thanks. I have breathed the same air as that bird for my part. Congrats on your well-deserved whirlwinds, my friend. SO great being with you - and everyone! - at Poetry Camp. I'm finally enjoying some of the follow-up posts, as we got orders to evacuate right after returning home last week. (Hoping to make it home tomorrow, though we might not have power!) Hope you are getting a little rest this week; take care of yourself and your Muse!